Before becoming president of CONAIE I was from a very small indigenous community that is called Sarayaku. In this community, since about 1996, I was involved in the struggle against Chevron and other oil companies. In that period, we successfully drove these companies out of our territory. After that I was involved in organizing in my community at a very local level, not even at the provincial or regional levels. So, it’s been a huge jump from being a representative in a community to a national representative of CONAIE. Officially, CONAIE was founded in 1986. After this point it began its political work, with three axes of struggle: land, justice, and liberty for the indigenous peoples. In 1990 there was one of the biggest demonstrations in Latin America, which became known as the Indigenous Uprising. This uprising demonstrated that in Ecuador the indigenous movement had moved from the margins to the centre. It surged forth as a movement with its own perspective, and began demanding a plurinational state, collective rights, and territorial rights for indigenous peoples in the 1990s. Throughout the 1990s the demand for a plurinational state was not taken into account because neoliberalism held sway in the country and the neoliberals said that the indigenous movement wanted to create a state within a state. The objective of framing the issue in this way was obviously to avoid recognizing indigenous nations in Ecuador. In spite of this neoliberal dismissal, the leaders of CONAIE at the time maintained the argument that the creation of a plurinational state was a way of recognizing social diversity – the mestizos, indigenous, and the various cultures that make up Ecuador. CONAIE was constituted from the outset by three different nationalities, and 18 different peoples, and it now includes 28 peoples. There is a distinction between peoples and nationalities. Peoples have a single language but have distinct cultural expressions, such as those of the Otavalos, Salasacas, Chibuleos. Nationalities are, specifically, organizations that group together in a single language, with a single culture, in a single space, a territory in which they live. Today CONAIE is constituted by three different nationalities, represented by the different organizations that make up the confederation – Ecuarunari, Confeniae, and Conaice. After these early struggles, CONAIE also began struggling for inclusion, and struggling to make participation part of the structure of the state, a state that would be what we called plurinational and communitarian. A state that would include all social actors, indigenous and non-indigenous. A state that would make programs and policy, and build political relationships, in a way that obeyed the people, obeyed the social masses. This is still the struggle. The rights demanded by indigenous peoples since the 1970s have continued to go unrecognized. The rights of indigenous peoples are not recognized and they are not included in the public policies of governments. The emphasis of my period in the leadership of CONAIE (2008-2010) is on forcing the national government to take account of indigenous rights in its public policies. This implies respect for indigenous cosmovision, ways of life, and cultures of the indigenous peoples. This is an important struggle, so that every law that is passed in the National Assembly is made with the participation of all social sectors, not just indigenous, but all citizens. We believe in building a country that is just, sovereign, and rooted in solidarity, rather than an authoritarian country under the imposition of outside powers. In the current conjuncture, what are the most important struggles in which CONAIE is involved? In the current conjuncture, the indigenous movement has four axes of struggle. First, there is resistance against the extraction of natural resources. The current programs of the government of Rafael Correa make a lie out of the traditional Quichua phrase, sumak kawsay [to live well]. In this context, the indigenous movements are saying that within the territorial spaces inhabited by indigenous peoples that there be respect for Pachamama [Mother Earth], and for the indigenous peoples. But the government wants to create massive projects in these areas, such as large-scale mining operations, forestry, and oil exploitation. There’s a big difference between respect and development. This is one of the issues that has caused a clash between the indigenous movement and the government. It is based in the problems of the economic model of this country. The second axis around which we have been struggling is the liberation and democratization of water. Water is being privatized in the current moment. 78 percent of water in this country is under private control, by private corporations, flower exporters, agro-exporters, and mining companies. We are demanding that in Ecuador that everyone should have equal access to water, without any privileges for private corporations. There are cases that would make you cry. There are indigenous communities, like some of those here in the Sierra, which have essentially no access to water, but where flower exporting companies use massive amounts. So, there is the struggle for water. Third, we are demanding that our indigenous governments, that have been legally established in their territories, be recognized as the sixth level of government. The government does not want to recognize this. It wants to stop at the level of the parroquia, or parish. But indigenous peoples have our own territorial administration, justice, and economic forms based in the mingas and communitarian forms of work. The fourth point of struggle is around forcing the government to respect the international agreements it has signed, such as those with the International Labour Organization (ILO) on indigenous rights, declarations from the United Nations, the Inter-American Convention on Indigenous Rights, and so on – that all of these be recognized here as the standard for living well and coexisting between the indigenous, mestizo, and non-indigenous communities. Can you explain your critique of the politics of the Rafael Correa government? On the one hand, Correa seems to employ the rhetoric of twenty-first century socialism and citizens’ revolution, while, on the other hand, there are clearly stark clashes between this government and various social movements. Can you explain this dynamic? 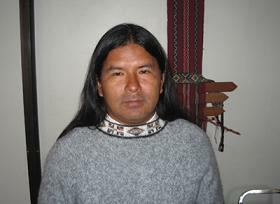 Correa entered the presidency in 2006 with the support of all the social movements – indigenous, environmentalists, human rights movements. But all of the social and political programs being introduced by this government have nothing to do with the program of his party, Alianza País, or a citizens’ revolution. The programs the government is introducing are based on other foundations, foundations that do not respect the collective ideas and demands of the grassroots that supported him. It’s clear that in the current conjuncture, what is being advanced under the slogan of twenty-first century socialism and citizens’ revolution has nothing to do with socialism. The government’s rhetoric suggests that because we’re all citizens of Ecuador we are a part of this citizens’ revolution and a new type of socialism. But in reality, there is no new type of socialism or socialist perspective. They talk about the Bolivarian Alternative of the Americas (ALBA), the liberation of Latin America, and being against transnational capitalists. But inside these alliances indigenous peoples are absent. It’s similar to the paradox of independence in the early nineteenth century. There’s an important popular saying around our independence: the last day of oppression, and the first day of the same. So they are talking about getting rid of the imperialists and all the mechanisms of capitalism. But what we see in Latin America is the creation of new oligarchies. Look at the new companies that are involved in the project, Integración de la Infraestructura Regional Suramericana (Integration of South American Regional Infrastructure, IIRSA). The bureaucratic elite of Latin America are involved in this project, the new capitalism in Latin America. Indigenous peoples are not seen as being a part of this process. Rather, indigenous peoples and other sectors are seen as a disturbance. Because we’re opposed to IIRSA, for example. It’s going to have a negative impact on indigenous territories and indigenous rights. Just imagine it, from Manta-Manaos Brazil to the Ecuadorean Amazon they’re going to build a giant highway. For what? To exploit oil, minerals, and forests. And the countries that are going to buy these primary products – Japan, Brazil, and Europe – are the same capitalist countries as always. At the moment, Peru and Colombia are negotiating new trade agreements with Europe. It is simply the case that the mask has changed. Because capitalism continues in Latin America. Socialism of the Twenty-First century is not a communitarian socialism that respects indigenous rights. It’s a copy of Western capitalism, which was clearly a failure. It’s a new type of capitalism in Latin America. And it too is going to prove to be a failure. The Pachamama, or the environment, is not going to survive. The Amazon basin is tremendously fragile, and has been exploited since the 18th century. What kind of development would be better? Indigenous peoples have long been arguing for a sustainable development model that would break with the extractive model we have today. I’ll speak, for example, of the South, and Central-South Amazonian region. In these regions the indigenous peoples are struggling for conservation – a type of conservation that will utilize natural resources only in order to survive, in order to live with dignity. This is quite distinct from overexploitation. The exploitation of natural resources under the current model – whether by transnational corporations or state companies – is an aggressive exploitation. In one day, for business purposes, they want to extract millions and millions of dollars worth of natural resources in order to accumulate capital. We have argued, however, that the accumulation of capital doesn’t serve our needs. Why would we want to accumulate capital? It’s been a complete failure. In Ecuador, agricultural production, communitarian agriculture production, has been one of the principal axes of our well being, because these agricultural producers meet the food needs of those living in the cities. But investment is moving out of agriculture and going toward natural resource extraction. There is also a lack of investment in tourism, but we’ve seen from the example of Costa Rica that investment in tourism is one possible alternative. We’ve argued that communitarian, ecological, responsible, and sustainable tourism is one possible alternative. I’ve heard Rafael Correa’s discourse. That we’re sitting on a mountain of gold and that it would be stupid not to exploit it. But this is short-term thinking, thinking only in the present. What about our future? This has to do with the government’s commitment to a technocratic and developmentalist economic model. Indigenous peoples are against this perspective. The indigenous movements was at the forefront of struggles against free trade agreements with the United States, the proposal for a Free Trade Area of the Americas, struggles against capitalism. So, now we don’t want a government that continues with this model. Ecuador has immense potential in its four regions – the Galapagos, Litoral, Andean Sierra, and Amazon – to use the visible resources of natural beauty rather than extraction of natural resources. When we struggle against the model that Correa falsely calls twenty-first century socialism, we are saying that this model has nothing to do with socialism. It’s the same capitalism as before, in other words, the continuation of neoliberalism. You can’t say that this is a development model of the left, because it has simply created a new privileged bureaucracy. Right now what we’re witnessing is a struggle between the new and old bureaucrats. The signs of continuity suggest that there’s been no change. When we make these objections, the first thing Rafael Correa says, to the indigenous movement and other popular sectors – is that we are trying to destabilize his government, and that we’re bent on overthrowing him. But you can’t find, in any of CONAIE’s positions, a call for the overthrow of this government. We are simply demanding that a new communitarian development model be recognized and adhered to. Rather than recognize our reasoned demands, Correa simply calls us terrorists and saboteurs. In today’s El Comercio, the national newspaper, you can read that I’m a terrorist. We want inclusion and we want to support the Ecuadorean nation with our positions. What we know is that in the history of socialism and communism, as in the history of capitalism, indigenous people have never been incorporated. Likewise, if we look at the independence liberation led by Simón Bolívar, indigenous liberation wasn’t a part of this. Bolívar liberated Latin America only to copy the colonialists, leaving intact a system which exploited indigenous peoples. Independent Latin America was just a new type of colonialism for indigenous peoples. We were still slaves and serfs in the Republican period. The “socialism” proposed by Rafael Correa, like the right-wing projects that preceded it, does not take indigenous peoples into account. We are not rising up violently. We’re acting within the limits of the new Constitution, which guarantees the right to resist. This includes taking to the streets so that our voices are heard. Taking to the plazas so that we’re heard. Going directly to the National Assembly so that our demands are taken into account. Last week, when the presidents of the countries involved in the Bolivarian Alternative for the Americas (ALBA) were meeting here in Ecuador, in Otavolo, they talked about indigenous rights. But the main representatives of the indigenous movement in the country, that is to say CONAIE, was never invited to the meeting. And we wanted to have a voice in ALBA. We wanted to say to the governments of ALBA that without the indigenous peoples of Latin America ALBA can’t exist. We will not be excluded any longer. And for saying this in protests outside the ALBA meeting we’ve been given this new name of terrorists and saboteurs. We’re supposedly against the nation. But we believe the truth will rise to the surface about these claims. For Canadian readers, can you say a few words about the role of Canadian companies in mining exploration and what open-pit mining projects might mean for the dispossession of indigenous and peasant communities in Ecuador? What types of popular resistance have arisen against the activities of these companies? Under the current government, the first law that they tried to approve was the new Mining Law. The government straightforwardly lied that mining under the new law would be nationalized, Ecuadorean, etc. The government said that its mining initiatives were going to be responsible and would respect the Pachamama, or Mother Earth. I’ve been to mining sites in Canada. I went to Toronto, and from there to an indigenous community where there was mining on a large scale. And even with all the technology that is available in the Global North, it’s obvious that the environmental damage that this kind of mining produces can’t be avoided. And in Chile, in the Pascua Lama mining site, and throughout Peru, we can see that it’s even worse. But the government says that large-scale mining projects here are going to be responsible. This is what bothers me the most, because he is simply lying. It’s a lie to say that nothing is going to happen. Mining is going to pollute massive parts of our water systems, amongst other disasters. Canadian mining transnationals have a massive presence in mining exploration in Ecuador. These companies want to engage in large scale mining projects, but they haven’t been able to because there’s been massive anti-mining resistance, especially in the southern mountains of Ecuador, as well as part of the Amazon. So they tried to approve this law, but they couldn’t because of the resistance. The people are saying no to large-scale mining. And so they’ve arrested many activists and put them on trial for terrorism and sabotage and all of this. I was in a mining forum together with President Correa. And I said to him personally that I was very familiar with the consequences of large-scale mining, and that he can’t lie to the people. In the current conjuncture, the government is finding it impossible to execute its plans in mining in Ecuador. Because there is a huge struggle. The major deposits of minerals are in indigenous territories, where indigenous peoples live. Maybe the Pachamama knew that if indigenous peoples were in the territories where there were forests, minerals, and oil we would protect these territories. For the last ten years there have been plans to execute large-scale mining in Ecuador. If these go ahead, all of the water basins of the Amazon and the communitarian agriculture will be fucked. It’s not going to be responsible mining. So there is massive resistance, and CONAIE supports this resistance. And I’ve personally gone to the mining communities and confronted the police and military as part of the resistance. We want to live in peace. Nothing more. We don’t want this mining because we think it threatens the future for our children. In the long term, what are you struggling for? What do you want to change in Ecuador? In the long term, those governing this country are creating a disaster, an environmental disaster. It’s not as visible in the cities as it is in the countryside and Amazon, in the rivers and the lakes. We’re living through a drastic change in the environment. In the long term, Ecuadorean citizens are going to recognize that the demands of the indigenous movement, the idea of respecting the Pachamama, are the correct position. We’re living through an environmental catastrophe. You can see the effects in the Litoral. And there are going to be impacts in the Andean Sierra. The glaciers are disappearing. We believe that our future is grave, and we want all Ecuadorean citizens to know what’s going to happen if we continue on this path. We hope that in spite of the claims that we’re against the state, that we’re terrorists and so on, that our demands will be understood by the people.